The Maine Coast, with its many peninsulas, harbors, islands and inlets took thousands of years to form. Today if offers spectacular panoramic ocean vistas from its rock coastline to its sandy beaches. The variety is astounding and many opportunities exist to own oceanfront real estate that is truly unique. The coast of Maine is quite deceptive in that it is only 228 miles in length when measured from one end to the other. However if one were to transverse the entire coast, traveling along each bay, the distance is considerable more. In fact, at 3,478 miles it is surprising longer than California. Only the coastlines of Alaska at 5,580 miles and Florida, at 8,426 miles are longer, thus creating an unspoiled expanse of natural beauty that is truly Maine. Living in Maine would not be complete without considering its many islands, of which there are over 3,000. They are geographically diverse, ranging from small granite outcroppings to residential communities. Especially in and around the Casco Bay area, where there is year-round ferry service, owning a home on an island is a distinct possibility. Protecting Maine's natural resources is important. Over 49 islands and three coastal wetland parcels, combining for approimately 8,000 acres, are devoted to National Wildlife Refuge System and the long term protection of nesting seabirds. Not only is the coast of Maine big, it is also geographically diverse. Although most people live in the southern portion of the state – Cumberland and York Counties, residential alternatives can be found almost anywhere along the coast. Southern Maine includes the are from Kittery, just over the boarder from New Hampshire, up through Portland and the Casco Bay Region. This area is know for its Sandy beaches, historic villages and economic centers. The Mid Coast region stretches from just north of Portland to approximately Penobscot Bay and is well known for its jagged coastline, granite promontories, fishing communities and spectacular ocean views. 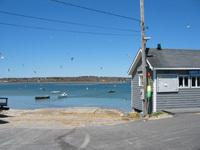 This region includes 16 towns, the most prominent being Brunswick, Harpswell, Bath and Wiscasset. Downeast Maine is the northern-most stretch of the state's coastline, and abuts Canada's province of New Brunswick. The dividing line between downeast and the mid-coast is the city of Belfast and the Penobscot River.This section of Maine is synomomis with maritime activities, the rocky coast, rustic villages and dramatic views. The area is well know for Acadia Nation Park and the towns of Deer Isle, Southwest Harbor, Blue Hill, Castine and Bar Harbor. Maine offers many opportunities for owning ocean front and ocean view real estate. Home and land prices vary significantly from one end of the coast to another. To get a good understanding of each region of Maine, a good place to start is with an overview of our Coastal Maps. Each regional summary includes a detailed map and local information. Explore all of the Maine coast by region, including the Northern, Mid Coast, Casco Bay and Southern areas. Each coastal region of Maine offers very different home price, lifestyle and community options.